A little lemon gives this roasted cauliflower excellent flavor along with the garlic and fresh parsley. This makes a nice side dish and an excellent replacement for potatoes or rice, a nice boon if you're trying to lower your carbs. The ingredients are simple, but they offer plenty of flavor. Sprinkle the hot roasted cauliflower with the optional Parmesan cheese as soon as it comes out of the oven. Alternatively, pass the Parmesan cheese at the table. Line a rimmed baking sheet or roasting pan with foil. In a medium bowl, whisk the olive oil with the lemon juice, garlic, salt, pepper, and parsley. Add the cauliflower florets and toss to coat thoroughly. Spread the florets in the prepared baking pan. Bake for about 15 to 20 minutes, or until tender and browned, turning about halfway through the cooking time. Remove from the oven and sprinkle with a few tablespoons of Parmesan cheese, if desired. 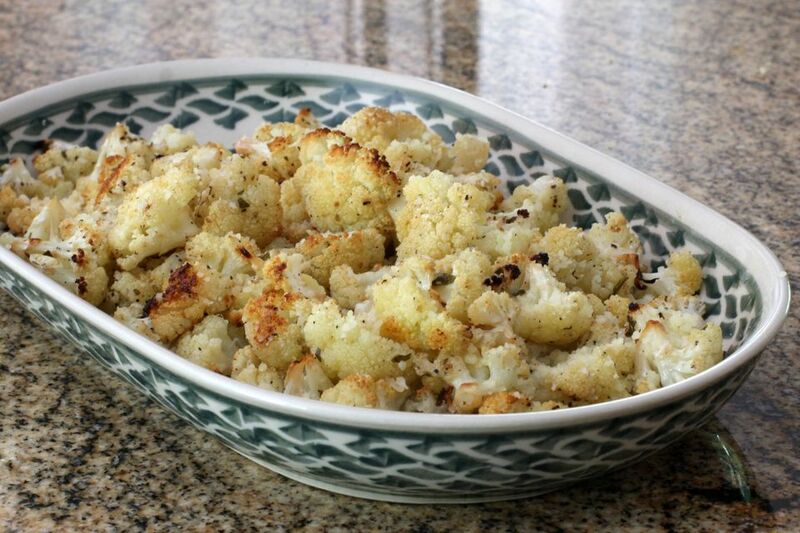 For faster roasting, cut the head of cauliflower into 1/2-inch flat slices.